September is the month of denial. Summer's on the way out, school's back in, and we're never quite ready to accept it. So, what could be better than an escape into pure cinematic fantasy? To that end, we’ve rounded up all the best independent cinema, film festivals and unique movie events around London this month. After an inconsistent August, London tends to experience an Indian summer in September, with gorgeous sunny days scattered among the omens of approaching autumn. Make the most of summer's last gasp with the end of the year's open-air film season. 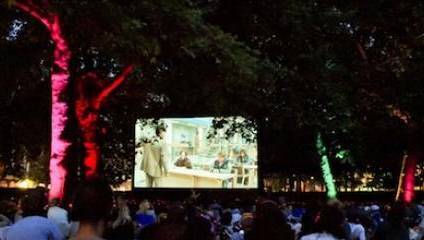 The Luna Touring Cinema has the pick of the royal parks, with crowd-pleasers like Close Encounters Of The Third Kind on 3 September and Pulp Fiction on 6 September. They're also playing Jaws on 28 September at Brockwell Lido - if you're easy to scare it might be better to take your al fresco dip before the shark trauma begins. Rooftop Film Club, which splits its time between Peckham's Bussey Building and the Queen of Hoxton, has a more alternative run of films through the month. The Hoxton venue hosts horror with Get Out on 4 September and cannibal classic The Silence Of The Lambs on 6 September (just don't forget your skin lotion for that one). They're also showing one of our favourite romances, Eternal Sunshine Of The Spotless Mind on 13 September, which tugs the heartstrings as it poses tricky questions about memory. The sister events in Peckham will host recent critic favourites Nocturnal Animals on 2 September and Dunkirk on 9 September alongside crime caper classics like True Romance on 4 September and the unforgettable Heat, which pitches De Niro against Pacino across the LA sprawl, on 17 September. Some outdoor screenings have a magic ingredient. Nomad Cinema is an innovative project run by volunteers, whose profits go to South African charity The Sustainability Institute. They've got two screenings at Queen's Park across the month: La La Land on 9 September and the gorgeous Italian love letter to film Cinema Paradiso on 23 September. For something a little more romantic try Movies On The River, Time Out's series of outdoor screenings on a barge floating down the Thames. They host two weeks of perfect date night movies, including Dirty Dancing, Notting Hill, Clueless and When Harry Met Sally. If you're liable to get seasick on a boat but untroubled by vertigo, you could also consider movie night at The View from The Shard. There you get a free cocktail and 360 degree views of the capital at the UK's highest cinema – check it out for The Big Lebowski on 8 September. If you ever want to see a film but you're not sure where to go, it's always worth checking out what's on at the BFI Southbank. Alongside their spread of unusual new films and forgotten gems, the cinematic institution is running two special seasons throughout September. There are almost thirty Stephen King adaptations currently being developed for TV and film, so it's high time for a retrospective of existing classics based on the cult author's works. The BFI will be screening Carrie on 1 September, The Shining on 3 September, Firestarter on 15 September, The Shawshank Redemption on 17 September and Stand By Me on 30 September. They're even planning a Stephen King Film Quiz at the Blue Room on 22 September, where proper buffs can claim gory goodies as well as glory. If you're too squeamish for all that, the BFI are also running a film series to celebrate US jazz greats with screenings of their British TV appearances, including Ella Fitzgerald on 9 September, Dizzy Gillespie on 12 September and Thelonious Monk on 20 September. Film buffs who don't live in central London are probably used to a trek to get to a lot of London's big film events. This month the cinema is coming south – and it's free! Peckham and Nunhead Free Film Festival runs from 1-10 September with a host of free screenings, including both Goodfellas and Turkish gem Mustang on 6 September and Raving Iran, where a pair of DJs battle the restrictions of the religious state, on 8 September. They've also got the quirky Knitflix night on 4 September, where they'll show archival knitting footage from Pathé films, compered by local comedy writer and knitter Sarah Dean. This will be followed by a screening of Nudinits, the world's first all-knitted animation. The website notes that 'knitting during the screening is strongly encouraged'. This is not a wind-up. Portobello Film Festival, which runs until 17 September, does things a little differently. The West London screenings are organised by nationality, so you can take your pick from a night of films from different countries: French on 1 September, Russian on 2 September, German on 6 September, Spanish on 14 September and Dutch on 15 September. For more thoughtful European cinema you might want to try Open City Documentary Festival at the ICA, which focuses on works from "poetically political" filmmakers Vitaly Mansky and Pierre-Yves Vandeweerd. No roundup of the capital's cinema would be complete without checking out London's independent cinemas. Leicester Square legend The Prince Charles Cinema has more great movies on than we could possibly list, but if pressed we'd go for the double-bill of Boogie Nights and Taxi Driver on 23 September, or the implausible Wes Anderson marathon on 30 September, where you can see eight of the eccentric director's flicks for the price of just one ticket. You might want to bring a coffee for that one. If you prefer your cinema 'so bad it's good', you can't miss a screening of cult disasterpiece The Room, whose deranged director Tommy Wiseau will be on hand to explain himself from 2-9 September. Our pick of the rest includes David Lynch's tragic tale The Elephant Man at Hackney Picturehouse on 6 September, factory-farming fantasy Okja at House Of Vans on 7 September, psychedelic onslaught Enter The Void at Moth Club on 10 September and the classic heist gone wrong of Dog Day Afternoon at The Cinema Museum on 27 September. Perhaps the most interesting special screening of the month is Deptford Cinema's presentation of 1961 movie Victim on 4 September. This showing marks 50 years since the Sexual Offences Act, which partially decriminalised gay sexual relations. The film centres on a closeted British lawyer and is credited with changing the national conversation on LGBT issues at the time. If you like a dose of politics and history with your cinema, you're unlikely to find better – and it's only £6.